Process to get the blend uniformity and effect of particle size during the blending of the pharmaceutical dosage form ingredients. Blend uniformity is an important factor in pharmaceutical manufacturing. A poor uniformity of the blend can cause the rejection of the product that can lead to the loss of revenue. No method is developed yet to determine the uniformity of blend during the mixing. Therefore, blending is a critical process that can affect the quality of the product. When active material is added in small quantity in the batch, the sandwich method of blending should be employed where the active material is added between the layers of the excipients and mixed. The particle size of the formulation ingredients can affect the physical properties of the product. Dissolution of the tablets is affected by the particle size of active ingredients. De-mixing of the blend ingredients may occur due to the over blending of the bland. It can cause the segregation of the active material in the bland and finally can show the results out of blend uniformity limits. Therefore, it is important to validate the mixing time in the manufacturing process of tablet dosages forms. The particle size of the ingredients plays a great role in the de-mixing process. A big difference in the particle size of the active ingredients and the excipients may cause the de-mixing. A fine powder form of the ingredients should be avoided. Unloading of the blend should be done carefully to avoid the de-mixing. According to 21 CFR 211.110 (a) (3) proper mixing of the ingredients is required to ensure the uniformity of content. Segregation of the active material may occur when the sample is placed on any vibrating surface that can cause the analytical error. 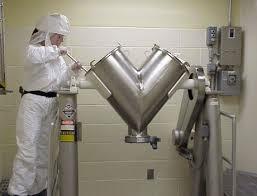 Blending process is a GMP activity, therefore, it should be done and monitor carefully.